Still enjoying this series, still very pleased at the little tour you get of the city named, still disappointed that you don't get a real look at the city named.I like the adventure, I liked the lookalike ducks. I liked all the places they went - I just wish I could really SEE them. This is a fun series for a beginning reader, especially one interested in other countries. I'd give this one 3.5 stars. Dodsworth and his pal duck take a trip to London and have quite an adventure. First duck causes quite a stir at the local pub when his dart throwing turns out to be disastrous. Then there’s a big mix while Dodsworth and duck are waiting for the double decker bus and Dodsworth. Dodsworth realizes the duck he’s with isn’t his duck, but the official Royal Duck! But where is Dodsworth’s duck? The Royal Duck offers to help Dodsworth track his duck down in London. Do they ever find him? You’ll have to check this adventurous early reader today and find out! 3.5 for this very cute early reader chapter book about Dodsworth the mouse and his duck. This one started a little slowly for me but quickly picked up when Dodsworth gets separated from the duck. The book gets funny as Dodsworth panics and the duck just enjoys himself. Aidan (now 7!) really enjoyed it and wants to read more of the books in the series. Thanks to Sarah P. for the recommendation! Probably best for K-2 age group. Great for early readers to read alone (or with an assist) or as a read aloud for younger kids. Dodsworth and the duck are traveling again. Dodsworth's and his naughty duck are separated at a bus stop (while riding a double decker bus). The story takes us through many iconic places and sights in London: Picadilly Circus, the clock tower, Buckingham Palace, and they even meet the queen! This book left a lasting impression as this morning set up London Bridge with pillows and he declared the Bruder lady the Bruder Queen (after reading the book the night before). Cute! We love "Dodsworth in (place)" series.Not only the story is entertaining but it is also educational; the book mentions famous places within the city.It is best to read the series in order but the individual books can be enjoyed by itself (however, do read the "The Pink Refrigerator" and "Dodsworth in New York" in those orders, first!). Recommended Ages: grades 2-3Despite a dart-throwing episode at a local pub and a case of mistaken identity, Dodsworth and his mischievous duck companion receive a royal invitation to stay at Buckingham Palace during their trip to London. Tim Egan's art continues to delight - with iconic scenes of Buckingham Palace, double-decker busses, Tower Bridge, and Big Ben in the Clock Tower. This story of mistaken identity was not our favorite of the bunch, but we'll certainly be back for more. Dodsworth and the wacky duck tour London...From the Elf: "I like that the duck goes away on the double decker bus, and when Dodsworth says, 'Let's wait for the next bus,' and the duck doesn't hear him. "From the King: "Funny." Sometimes it can be hard to find beginning reader books that have an interesting story and this one does. This is perfect for the kid who had outgrown most of the beginning readers but isn't quite ready for chapter books yet. I can't wait to see what's in store for Dodsworth and duck next. My little Witt LOVES all these books. They teach young readers about historical architecture and culture in different cities around the world. When he first read the series to me, we sat with the iPad and looked up pictures of whatever we were reading about... And the little duck is hilarious. I hate it when you lose your duck, but why not in London, a great city? I have been there twice! And even better, if you duck gets confused with the Queen's Royal Duck, you might get invited to stay at Buckingham Palace. Sounds good to me!!! Nice beginning chapter book all about London! While traveling in London, Dodsworth gets separated from his duck, who just happens to be a dead wringer for the Royal Duck. 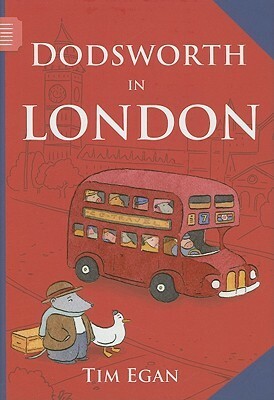 It's a lovely tour of some London sites as Dodsworth searches for his lost friend.Illustrations are cute. This one had me at, "I am the Royal Duck." Dodsworth is awesome. They actually keep getting better. This one had a bit of a Prince and the Pauper thing going. I love the illustrations and the continuity between books as well. A class act. #2. More adventures of Dodsworth and his cheeky traveling companion, duck. Gotta love them both. Beautifully illustrated. I loved the mix up with the Guard Duck. Adorable series. Funny and cute and fun to read. yep, definitely love these books. Another book about London we are reading for our Olympics unit study.